Aquatic invasive species are any plant or animal species—such as quagga and zebra mussels—introduced to a body of water that, once established, spreads quickly from their point of introduction. Through competition for resources, predation, parasitism, or causing physical or chemical changes to the invaded habitat, invasive species can hugely impact the diversity or abundance of native species. Quagga and zebra mussels are two closely related mussel species that were introduced to the Great Lakes in the 1980s. Since that time, the mussels have spread to many eastern waterways, rivers, and lakes. Click on the map below to see in which California waterways quagga and zebra mussels have been found. Quagga mussels were found in Arizona's Lake Mead in early 2007 and subsequently spread throughout the lake's lower basin. 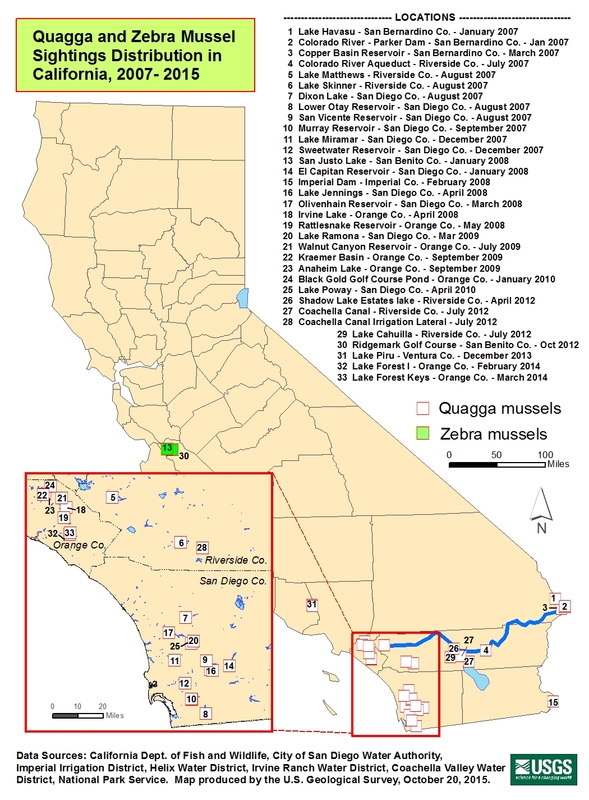 Quagga and zebra mussels are currently located in a number of lakes and waterways in California. The quagga/zebra upsets the food chain by consuming phytoplankton that other species need to survive. They are filter feeders—an adult filters 1 quart of water per day—that consume large portions of the microscopic plants and animals that form the base of the food web. The mussels can colonize on hulls, engines, and steering components of boats, and if left unchecked, can damage boat motors and restrict cooling. The mussels frequently settle in massive colonies that can block water intake pipes and threaten municipal water supply. California could spend hundreds of millions of dollars protecting the state's water system from quagga/zebra infestation.